Buckwheat is not as common in the United States as grains such as wheat or oats, but you can use it in many of the same applications and receive numerous nutritional benefits. You can purchase buckwheat as a flour to use in baked goods or as groats for a hot cereal. 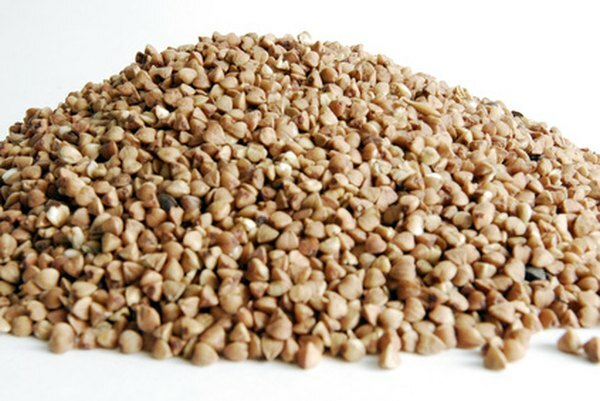 Toasted buckwheat, typically referred to as kasha, is also common. However you choose to use it, buckwheat is a good option for adding variety and nutrition to your diet. A quarter-cup serving of buckwheat contains 146 calories, 1 gram fat, 30 grams of carbohydrate and 6 grams protein. Of the calories in one serving, 79 percent come from carbohydrates, 8 percent from fat and 13 percent from protein. Although buckwheat contains a moderate amount of protein, it is not a complete protein. The carbohydrate content of buckwheat includes 4 grams of fiber, which is 17 percent of the daily value. Buckwheat is a good source of many essential B vitamins. Each serving contains 15 percent of the daily value of niacin, 11 percent riboflavin, 5 percent pantothenic acid, 4 percent vitamin B6, 3 percent thiamine and 3 percent folate. Buckwheat is not a good source of vitamins A, B12, C, D, E or K.
Buckwheat is an excellent source of many essential minerals. One serving provides 28 percent of manganese, 25 percent magnesium, 23 percent copper, 15 percent phosphorus, 7 percent zinc, 6 percent potassium, 5 percent selenium and 5 percent iron. The iron content of buckwheat is not as bioavailable as it is in animal sources; however, you can increase its absorption by consuming it with foods containing vitamin C, such as orange juice. Wheat and wheat products contain a protein called gluten, which is not tolerated by people with celiac disease. Although buckwheat sounds like a wheat-related grain, it actually is not a grain and does not contain gluten. Buckwheat is fruit seed and is classified as a pseudocereal, along with plants like quinoa and amaranth. Buckwheat is rich in many phytonutrients that promote health and may help prevent the onset of chronic diseases. Buckwheat is a good source of the antioxidant flavonoid rutin, which may help to protect the heart against oxidative damage. Other phytonutrients in buckwheat include lignans, phenolics and chiro-inositol, each of which has specific health-promoting effects. For example, chiro-inositol may help lower blood glucose levels in people with diabetes.